To celebrate America’s 240th birthday, BAMF Style is showing off a great, well-researched infographic from the folks at SunglassWarehouse.com that breaks down the suit worn at the first inauguration of every American president from George Washington’s brown broadcloth suit in 1789 right up to Barack Obama’s dark, bullet-resistant suit in 2009. I was especially interested to see what was worn by William Henry Harrison, the ninth President of the United States and the deliverer of the longest inaugural speech at 8,495 words… far longer than George Washington’s shortest address which came in at only 135 words. Harrison’s speech was the longest thing about his presidency, which lasted hardly a month before he succumbed to the fatal pneumonia that he had likely contracted by delivering such lengthy remarks without any outerwear on that cold wet morning in March. In fact, the greatest product of William Henry Harrison’s presidency may be the Parks and Recreation episode that lampooned it. A few weeks ago, I called for the esteemed readers of this blog to Show Us Your BAMF! I received many excellent submissions from around the world, and I’m honored to present each gentleman’s look – along with a short bit written by them – in person. The submissions received prove that BAMF Style has some of the snazziest fans out there. Like it or not, the holiday season is upon us. For many folks, that means parties, gifts, and the unfortunately inevitable fruitcake. Whether you’re Buddy the Elf or Ebenezer Scrooge, BAMF Style has got you covered to make each celebration a merry one. Ah, yes. Designed to be the consolation for all desk jockeys disappointed with their holiday bonus (or lack thereof), most offices put forth some sort of effort in entertaining everyone with a few old and/or cheap decorations, and – ideally – plenty of liquor. Whether you’re an ad man or a cop, your office will likely throw a Christmas party. Be ready. What to Wear: As these are typically at the end of a working day, that depends on the office culture. 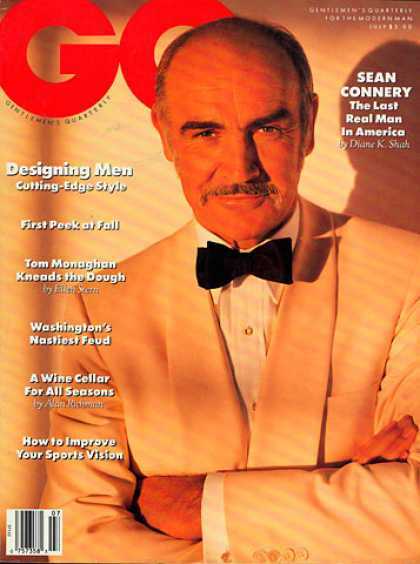 For many industries, that is still a jacket and tie for men. What to Imbibe: If your office is generous enough to have some booze present, let the others enjoy the cheap vodka. A whiskey on the rocks is the perfect way to unwind after a long day, tune out during a long party, and still exude masculinity. Music: Don’t start a sing-a-long. Instrumental versions of holiday songs, perhaps from the Hollyridge Strings, would be advised to keep the singing to a minimum. So your friends are having some people over for a party? Maybe this is your chance to finally get your hands on a cheap, unnecessary trinket from the local Five Below as a gift during an ill-advised round of White Elephant! Look how much happier Nick Charles looks without antler ears on. Then again, he’s also standing next to Myrna Loy so who wouldn’t be happy? As Seen In: American Psycho, Spy Game, The Thin Man… the list goes on. What to Expect: You’ll see a few of your friends and a LOT of their friends… most of whom you’ve never seen before and will make you question why you’re friends with the host in the first place. This is what liquor is for. 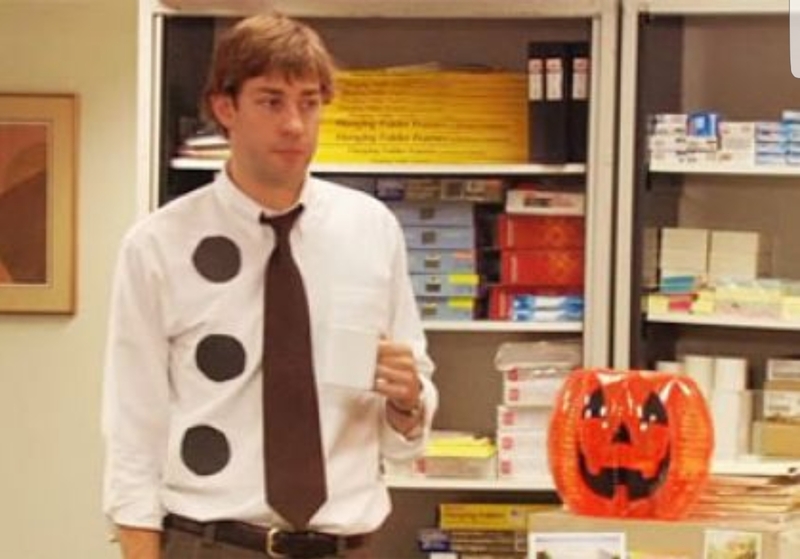 What to Wear: This depends on the company. 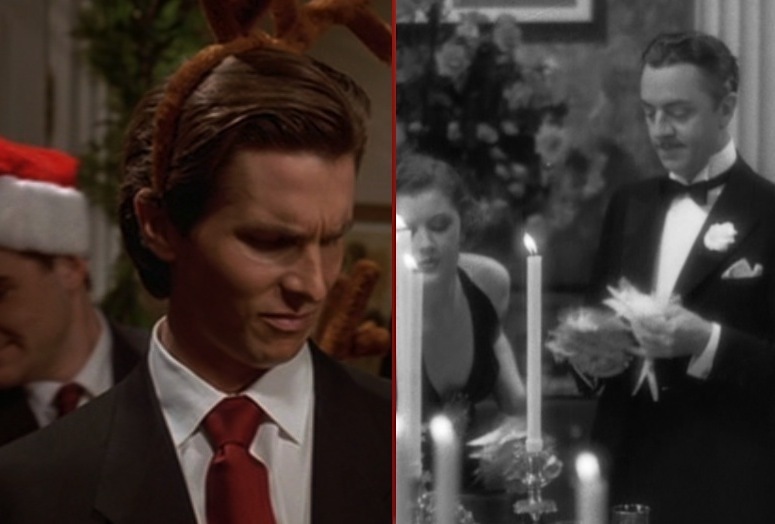 The yuppies in American Psycho wear their ’80s power suits (and antlers, in some cases), the formal dinner guests to Nick Charles’ Christmas murder revelation wear black tie, and Robert Redford’s Spy Game operative sports a comfortable fisherman’s sweater over his blue plaid shirt for the party. All are correct in their context. A party like this is not the time to wear your mom’s ugly Christmas sweater. What to Imbibe: It’s not polite (but often tempting) to polish off a bottle of your host’s finest single malt, so a whiskey highball will keep you hydrated without sending you back to the bar every ten minutes to refill your glass. Plus, whiskey has a pleasant warming effect that will combat the frightful weather outside. Of course, a host may have some drink choices of their own, often of a rum punch variety. These drinks may be offered or – as the “Have a cocktail!” undercover waiter insists in The Thin Man – forced upon you. If you are the host and looking for a fun but classic holiday beverage to prepare, a Grasshopper is a popular and tasty option with its minty flavor and green color to make a few people get into the holiday spirit. Mix all of the above ingredients with ice in a well-chilled shaker and serve in equally chilled martini glasses. The two crème liquors involved are typically inexpensive, but Tempus Fugit Spirits offers a few fine-tasting examples if you don’t want the usual DeKuyper or Jacquin’s. Music: Since you never know who will be there, play it safe with more “wintry” songs. Dean Martin’s 1959 album A Winter Romance included plenty of non-Christmas holiday standards like “Let It Snow!” as heard in Spy Game. Have your holiday traditions remained simple without the distractions that major department stores and TV networks are tossing out your way? Do you spend your days driving around on dirt roads in a bright orange muscle car with your cousin? If so, then I’ve got the celebration for you! Bonus points if you invite both the sheriff and his deputy to your holiday Christmas Eve. Double bonus points if anyone in the room is named “Cooter”. As Seen On: The Dukes of Hazzard. What to Expect: Some good old-fashioned holiday spirit with decorations, family, caroling, and everything else lionized in Christmas songs of yore. If you happen to live in a bucolic but corrupt county in the Deep South, perhaps the county commissioner will show up uncharacteristically beaming and showering all of those present with gifts. If you happen to live in a realistic household anywhere else, the first half of the evening will be full of repressed emotions as the second half is marred by loud – and somehow not cathartic – fighting. What to Wear: The Duke boys sport dark plaid shirts with their usual light wash jeans and brown cowboy boots. Anyway, the beauty of egg nog is that it can be enhanced by damn near any booze. I prefer whiskey or brandy, but I’ve also found rum to be a pleasing addition. Art of the Age’s Root liqueur is also an excellent mixer for egg nog. The Dukes probably added moonshine, though. Music: The Dukes sing along to “O Holy Night”. 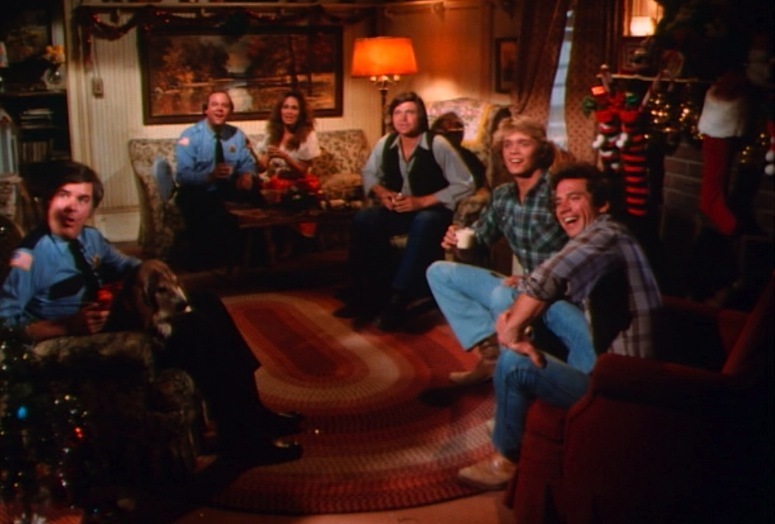 If John Schneider and Tom Wopat show up at your doorstep looking to belt out a few tunes, it’s polite to invite them in for some nog. Since most people’s families are horrible singers (The Partridge Family included), stick to the standard Christmas albums from the pros like Sinatra, Bing, Ella, and Nat. The easiest of holiday celebrations, all that is required is to show up at a bar with a few bucks in your pocket for drinks. 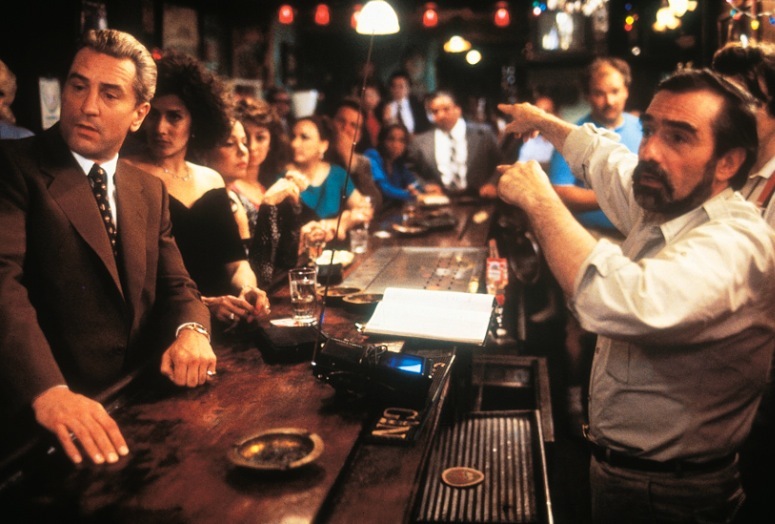 The bartender always knows best, especially if its Martin Scorsese. What to Expect: Lots of hugging, especially if you’re meeting up with fellow mob associates days after a multi-million dollar airport heist. You may be proud of some of your more extravagant Christmas gifts, but keep them to yourself; if Jimmy the Gent is around, you’ll just end up murdered in said gifts within a few weeks. What to Wear: A nice, seasonal sport coat, perhaps matched with a tie or a sweater. You’ll want to be comfortable if the bar gets crowded, but you still want to look good… especially if some single (or unhappily married) women are looking to relieve themselves of the holiday blues. At eleven o’clock Henry and his pals were at the bar at Maxwell’s drinking Screaming Eagles – shot glasses of white Chartreuse dropped into large goblets of chilled champagne. Sounds good for a Christmas party, doesn’t it? Music: While someone will be tempted to put Mariah Carey’s “All I Want for Christmas is You” on the jukebox, a better judge of musical talent would choose the 1963 Phil Spector-produced album A Christmas Gift for You from Phil Spector. This record is one of my all-time favorites (and has been described by one of my friends* as “one of the finest pop albums ever made”). This is the album where we hear The Ronettes, The Crystals, Darlene Love, and Bob B. Soxx and the Blue Jeans perform Christmas standards with so much unique energy that no act could ever reproduce. Goodfellas particularly made use of The Ronettes’ “Frosty the Snowman” and Darlene Love’s “Christmas (Baby Please Come Home)”, the latter of which has been performed by Love herself on David Letterman’s Christmas show every year since 1986. * My friend Matt makes this statement on his great music blog Leading Us Absurd. Not much of a Christmas guy? Whether you watched your police partner get gunned down by a reckless liquor store robber on Christmas Eve or you’ve been estranged with your family ever since you faked your identity to either escape the Korean War or become a Pan Am pilot, everyone has a good reason why they may want to spend the holidays wallowing in misery. 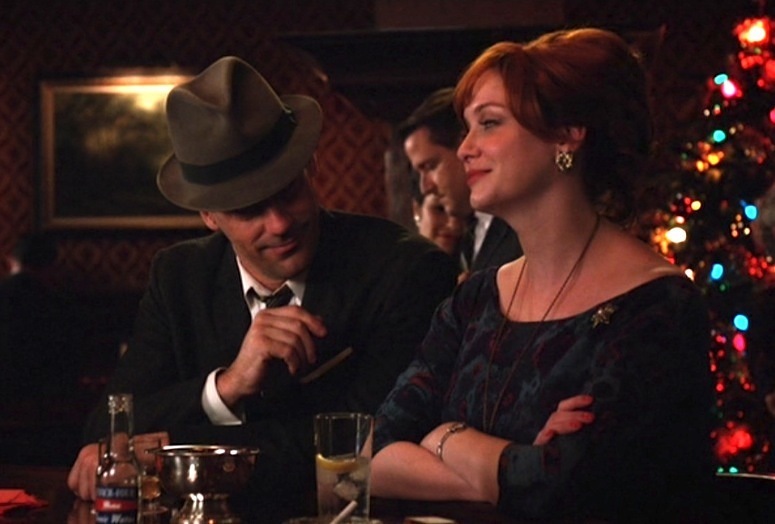 Like all situations, drinking alone at the bar is much better with Christina Hendricks around. 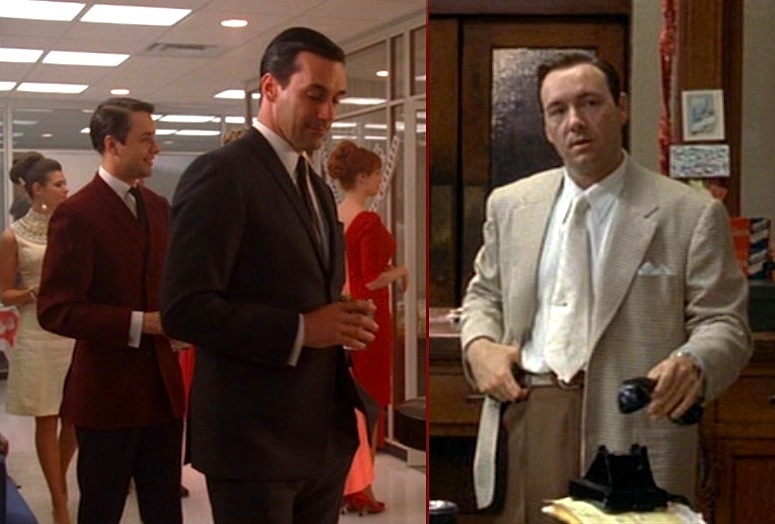 As Seen In: Mad Men, of course. What to Expect: A bar full of lonely people, all drowning their sorrows in drink. You’ll sit down on the end – somehow this bar is built primarily of ends – and grow an instant 5:00 shadow as you stare into the bottomless pit of a life that your glass of whiskey represents. Your cynical internal monologue reflects on the disparity between the happy holiday shoppers outside and the feelings of inferiority and loneliness bouncing around inside your brain. Merry Christmas. What to Wear: Dark flannel suit, white shirt, slim tie loosened at the collar, and tilted fedora. The fedora is really only best if you’re traveling back in time… these days, many men who try to pull it off just can’t. What to Imbibe: Start with an Old Fashioned then stick to Scotch, neat. You’ll probably also want a deck or two of cigarettes. Music: Something classic, of course. Don and Joan listen to Doris Day’s 1964 version of “The Christmas Waltz” in a Manhattan bar, although Sinatra’s is more befitting for being the man at the end of the bar. When calling his FBI nemesis from a New Orleans watering hole in Catch Me If You Can, Frank Abagnale ironically hears the Hollyridge Strings’ soft cover of “I’ll Be Home for Christmas” in the background. If you really want to feel lonely, Dean Martin’s “The Christmas Blues” keeps the Rat Pack vibe alive as well as giving you a chance to hear a side of Dino that wouldn’t work as well for the house party mentioned above. Uneasy about his upcoming wedding to Ann Charteris, who divorced the second Viscount Rothermere after her long-time affair with Fleming was uncovered, Fleming began writing the novel which would become Casino Royale. 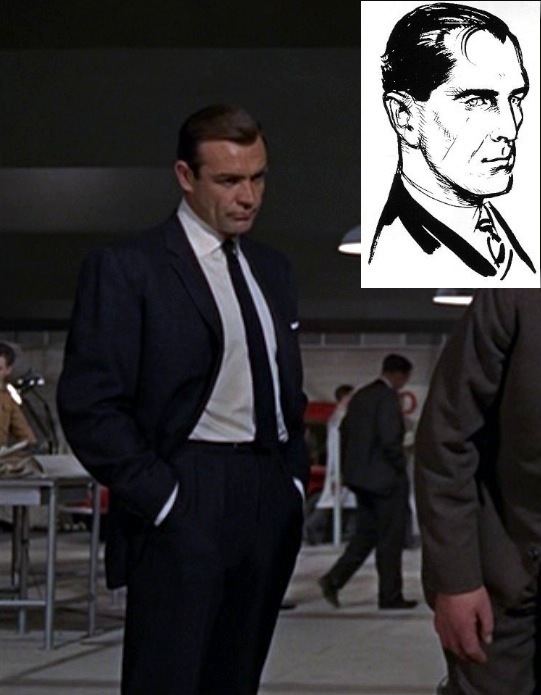 The novel’s hero, the dryly-named James Bond, was a thinly veiled version of the man Fleming wanted himself to be – and soon became recognized as the man every man wanted to be. Bond was originally supposed to be, in Fleming’s words, “an extremely dull, uninteresting man to whom things happened.” Thus, Fleming chose the most boring name that he could find – James Bond, the American ornithologist who wrote the Birds of the West Indies field guide.